blues (blooz) noun. Spiritual, emotional lamentations; Melancholic music developed by African Americans in the rural south during the late 1800’s and finding a wider audience in the 1940’s; the foundation and cornerstone of rhythm & blues (r&b) and rock-n-roll. soul (sohl) noun. The principle of life, feeling, thought, and action in humans, regarded as a distinct entity separate from the body, and commonly held to be separable in existence from the body; the spiritual part of humans as distinct from the physical part. rock-n-roll (rok n-rohl) noun. A style of popular music that derives in part from blues and folk music and is marked by a heavily accented beat and a simple, repetitive phrase structure. Collen first met gifted vocalist Debbi Blackwell-Cook in 2010. She not only performed at his wedding that year to costume designer/photographer Helen L. Simmons singing an accapella version of Ella Fitzgerald’s ‘The Man I Love’ but is also his wife's godmother. After the wedding Debbi visited both of them often at their home in California often. Pretty soon Phil & Debbi were singing Motown tunes and classic blues numbers around the house. Debbi eventually sang on several MANRAZE releases including ‘I, Superbiker’ and ‘I Surrender’. The duo began performing live including performances at San Diego’s Gerson Institute, 95.5 KLOS’s Heidi & Frank radio show, and a television broadcast for UTV. One afternoon in 2013 in their New Zealand kitchen Phil and Helen joined on vacation by Debbi wrote the first of several original tunes that would soon become the self-titled album ‘DELTA DEEP’. Upon returning to the states the trio continued to write. Phil & Debbi soon began recording the new music in Phil’s home studio. During this same time a chance encounter with Randy Crawford/Crusaders drummer Forrest Robinson allowed Phil to expand his and Debbi’s sound. Memphis, Tenn born drummer Forrest Robinson, who has deep roots in soul, r&b, gospel, heavy metal, and jazz was neo-soul singer India.Arie’s drummer when he met Phil for the first time. Forrest's musical journey included drumming for TLC, replacing famed drummer Steve Gad in The Crusaders, playing with Ray Parker Jr. and playing for Randy Crawford and Engelbert Humperdink among others. Phil and Forrest’s reconnection years after their initial meeting later proved vital to the continued growth of DELTA DEEP. With Forrest entering the band as the drummer delivering soulful backbeat, unsurpassed kickdrum energy and primal percussion rhythms DELTA DEEP continued to gain headway securing even more live performances for radio, tv and stage all the while recording their debut release. Enter Grammy award winning Stone Temple Pilots’ bassist Robert DeLeo who was suggested to Phil by journalist/biographer Chris Epting. Chris was aware of DeLeo’s love affair with blues, funk, and soul music and stated he knew Robert would be a perfect fit for DELTA DEEP. Robert immediately said yes to being in the band and completed the soulful quartet. He lends his fiery and melodic ‘bottom end’ grooves to the group’s diversified music catalog. DeLeo’s avid dedication to jazz & Motown styled rhythm & blues offers a stealthy foundation that allows DELTA DEEP to showcase a dramatic range of untouchable musical movement they have made their own. With DeLeo’s entry into the band, a harmonious puzzle was brought to completion. 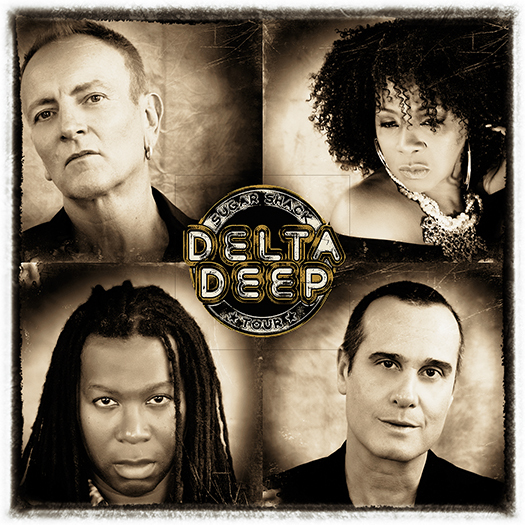 DELTA DEEP’s self-titled debut album was released to critical acclaim on June 23, 2015 entering at #2 on the iTunes Blues charts. November 27, 2015 Delta Deep released their jazz infused holiday classic for generations to come ‘Take Me Home For Christmas’. Their long awaited live performance CD/DVD (also available on vinyl) recorded at the legendary Daryl’s House, ‘DELTA DEEP East Coast Live’ (along with a NEW re-issue of their debut album) was released on Frontiers Music Srl Jan 26, 2018.